Right now you'll find photos in several sizes to use as wallpaper for your computer. These photos are from our flower garden. Soon we'll tell you how to get flowers just like this in your yard. We also have gardening tips, remodeling instructions and photo sequences along with all sorts of casual lifestyle hints. The first flower hint is in this photo. 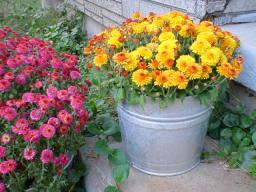 Abby bought Mums with buds (the flowers not yet open) so that the flowers would come out and last longer at home. The Mums came in plain plastic pots. To save the trouble of re-potting, and to get that rustic down home look, she dropped the Mums pot and all into the bucket. Works like a charm. In the flower photos note that the large images come in several resolutions. When downloading as wall paper, choose the resolution that is closest to the resolution of your computer monitor.